Strasbourg, 10 April 2019 – The European Committee for drawing up Standards in the field of Inland Navigation (CESNI) met in Strasbourg on Wednesday 10 April 2019. The meeting was chaired by Ms Lucia Luijten, representing the Netherlands. 11 Member States (Austria, Belgium, Czech Republic, France, Germany, Netherlands, Poland, Romania, Slovakia, Switzerland, United Kingdom), as well as the European Commission, the River Commissions (Moselle, Rhine) and 7 organisations approved by CESNI (Aquapol, EBU, EDINNA, ESO, ETF, GERC, IVR) participated in the meeting of the Committee. Brussels, December 20th, 2018. The European IWT Platform, this year created by EBU and ESO, is pleased to announce the nomination of Mr. Nik Delmeire as its coordinator. EBU Secretary General Theresia Hacksteiner and ESO Secretary General Gerard Kester: ‘We are glad to have Nik on board the platform. With his knowledge of shipping organisations he can very well contribute to the ambitions our sector has’. 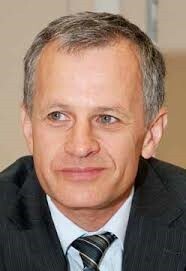 In his new capacity Mr. Demeire will be responsible for the coordination of the platform. As such he will in particular cope with innovation and digitalisation, one of the major challenges of the sector in the coming years. Nik will be one of the faces of the Inland Waterway Transport presence within Europe and act as our continuous presence in Brussels. 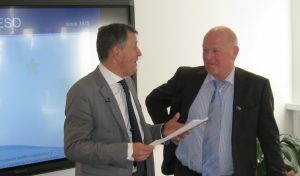 As coordinator of the platform he will be closely cooperating with the secretaries general of EBU and ESO. As of 1 January 2019 EBU and ESO, the two organisations representing the inland waterway transport sector at European level, established the “European Inland Waterway Transport (IWT) Platform”. The platform is intended to add a new dimension of expertise to the benefit of the entire inland navigation community and all institutions involved in it. And thus strengthen our sector. At the IWT Platform launch event on 21st of January 2019 our stakeholders will be able to meet Nik in person. During the first 30 years of his career he has taken the opportunity to cover most aspects of the supply chain of a large and multinational manufacturer of goods. Through these roles he got in contact with the European Shippers’ Council. 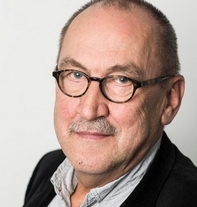 He joined ESC as Secretary General in October 2014. In this role he was heavily involved in initiatives and projects that should lead to maximal digitalisation and greening of all logistics processes. Solutions for difficult transitional measures have been incorporated in ES-TRIN 2019! 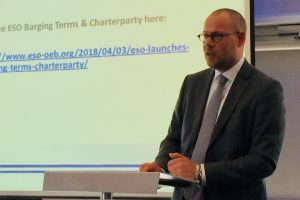 Brussels, 13 November 2018 – Press release ESO and EBU. The CESNI-Committee has adopted on 8 November 2019 the new ‘European Standard laying down Technical Requirements for Inland Navigation vessels’, ES-TRIN 2019, replacing ES-TRIN 2017. The solutions for difficult transitional measures are incorporated. EBU und ESO associated in the “ European Inland Waterway Platform ( shortly IWT Platform)“ have fully participated in the negotiations to make sure that the interests of the inland waterway transport sector will be taken into account as far as possible. The common efforts are now clearly yielding fruit! waterway transport sector have resulted in a solution for difficult transitional measures. They refer to noise protection, models for electrical equipment and installations, ship’s boats, escape routes and propulsion systems for passenger vessels, all serious bottlenecks for the inland waterway transport sector. EBU and ESO are pleased that with ES-TRIN 2019 solutions in the interest of the inland waterway transport sector were found. In order to guarantee a high level of safety of the transport on inland waterways and at the same time considering the technological developments, the European Standard laying down Technical Requirements for Inland Navigation vessels (ES-TRIN) is subject to a regular revision. ES-TRIN on itself is not binding. The Central Commission for the Navigation on the Rhine and the European Union will refer to it in their statutory framework, as with currently applicable Standard ES-TRIN 2017. ES-TRIN 2019 will enter into force on 1 January 2020. Brussels, May 3rd, 2018. 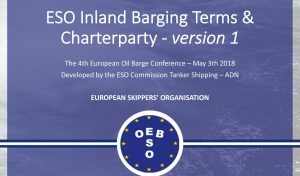 This day the ESO Inland Barging Terms & Charterparty were launched at the 4th European Oil Barge Conference, organised by ASDEM Ltd in Rotterdam. A step forward in the professionalisation of the inland tanker shipping sector. The inland tanker shipping needed its own terms and charterparty just as any other professional sector. Therefore back in 2017 ESO started developing these.with a group of experts and members. The development of the ESO Inland Barging Terms & Charterparty was done from the viewpoint of the shipowner/actual carrier. Striving for consensus as well as creating a document which can be used for negotiation, the ESO Inland Barging Terms & Charterparty form the basis for this. These terms can be seen as a modernisation of the current TTB-conditions or other common terms which are used today. As a European branch organisation which defends the interests of the private inland shipping entrepreneurs, ESO took its responsibility to form basic terms and a charterparty which strengthens the position of the individual shipowner/actual carrier, active in the inland tanker shipping sector. Meanwhile ESO continues to support the entrepreneurs and create a modern and professional sector, in consensus with all parties involved. You can download the ESO Inland Barging Terms & Charterparty here: Barging Terms & Charterparty. At this moment the document is only available in the english language. Brussels, 26 February, 2018 (ESO) – During the New Year’s reception of the ESO on February 26th in Brussels, nestor Gerard Kester was appointed as the new SG of the ESO. 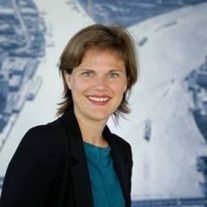 He succeeds the departing Secretary General, Hester Duursema (equally managing director of Royal BLN-Schuttevaer). The chairman Christiaan van Lancker spoke praising words about the role Duursema has played for the sector. He summarised her contribution as “sublime” and predicted a prosperous future for her. Duursema has full confidence in her successor. “Gerard does not only have an incredible knowledge base of inland shipping, but he also has a lot of heart for the sector. These are things that ESO is known for, passion and expertise. “Kester has been involved in inland navigation for decades. For example, his first job at the end of the seventies, was to ensure that women on board were allowed to count as crew members. 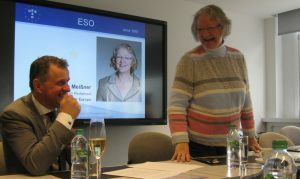 ESO also said goodbye to Herman Verschueren, Advisor-General DG Shipping, Exploitation and Intermodality at the FPS Mobility and Transport. Verschueren will retire after many years of involvement with IWT. We are very grateful to him for the enormous commitment to the establishment of the European inland navigation platform. Until his very last working days he has put his teeth into it. In line with the above, the president’s speech was dominated by the theme of “human capital”. 2017 was a historic year, when we look at the commitment that is being made to better safeguard and develop human capital. The professional qualification directive should ensure that the pool of qualified people is increased, since it concerns harmonisation of the way we test which competences. Gesine Meissner, MEP for the FDP, was our guest speaker and she stressed how difficult it was to reach a political compromise. Some countries did not want to participate at all, other countries found it difficult to fit it into the national school systems, etc .. After a few questions we concluded that the proof of the pudding is in the eating, whether it is workable and whether it delivers what we intended, namely a larger pool of qualified people working in our sector. In addition to this important topic, the president also referred to the research together with the European employee organisation (ETF), the so-called TASCS-study. This study looks at the crew requirements, what fits with the current time and what a system should look like? The aim is to develop a Add Newsystem flexible enough to adapt at current times and can adapt to upcoming developments such as semi-autonomous sailing. Serious bottlenecks have also been identified in relation to the safeguarding of human capital. For example, the various minimum wage laws that have been implemented in Germany and France. This is causing a lot of red tape, while wages for the nautical staff are fair at the moment. The Working Time Directive is also very cumbersome. But the biggest pain at the moment is the fact that the shore infrastructure along the Rhine is deteriorating. Local communities (f.e. Colon) have no idea how inland shipping works and the importance of inland shipping for the ins and outs of their economy. Inland shipping can simply not operate without good berths and car drop-offs. There is a huge challenge to reverse this trend. Here the European IWT platform will work very closely together with the German member organisations (BDB and BDS). Because inland shipping is all about people, but then people have to be able to work and live on board. Van Lancker concluded his speach with: “Every one of us can make a difference, but together we bring about change!”. Only joint efforts can make things move. CCNR Strasbourg, February 15, 2018 – During the first semester of 2017, the pace of economic growth in Europe surpassed expectations, propelled by resilient private consumption. The intra-EU-trade actually increased by 2.2% from the first semester of 2016 to the first semester of 2017. Several economic sectors benefited from these positive economic conditions such as the steel industry and the construction sector. The European inland navigation transport performance was not able to benefit from this economic growth during the first quarter of 2017 due to the environmental conditions. Low water levels on the Rhine and on the Danube, particularly in January 2017, together with ice periods on the Danube, reduced freight transport performance in these two river basins. With better water conditions during the second quarter of 2017, transport performance on the Traditional Rhine increased by 11% between the first and the second quarter of 2017. Inland navigation activity returned to 2016 levels, and transport performance on the Rhine even increased by 2% during this second quarter of 2017 compared to 2016. This recovery is a general evolution that has been observed both on the Danube and on the Rhine and on all its tributaries. Further details on the evolution by country, by inland ports and by market segment are available in the Winter Market Insight 2017/2018. share of imported coal increases, inland navigation is increasingly needed for the transport of coal from major sea ports to the hinterland. Nevertheless, coal consumption — especially in the energy sector — is currently decreasing in favour of renewable alternatives, and it is also foreseen that coal transport will decrease. This decrease is expected to be compensated by the growth of other market segments in 2018 and in particular by the transport of agricultural products, building materials and containers. The new quarterly report on European inland navigation, written by the Central Commission for the Navigation of the Rhine (CCNR) in partnership with the European Commission, has just been published. The Fall 2017 Market Insight provides a raft of information on the situation in which inland navigation finds itself at the beginning of 2017. The market observation and market insight are respectively annual and quarterly publications by the CCNR dealing with the European inland navigation market. volumes decreased during the first quarter of 2017. Although the situation had recovered compared to the end of 2016, the total transport performance on the Traditional Rhine decreased by 12% in Q1 2017 compared to Q1 2016, and on the Danube the reduction was 22%. This can mainly be explained by low water conditions at the beginning of 2017, and by ice periods that strongly affected Danube navigation at the beginning of the year. However, the evolution is not homogenous all over Europe. In particular, inland navigation goods transport increased in Belgium at the beginning of 2017, and this increase was strongly supported by container transport that continued its strong upward trend in Belgium, with an increase of almost 20%. 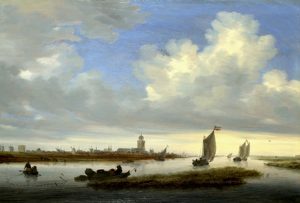 Full report (EN-NL-DE-FR) can be viewed directly at www.inland-navigation-market.org.